Security at airports is tighter than ever because of the attempted terror attack on Christmas Day, and that means long lines. 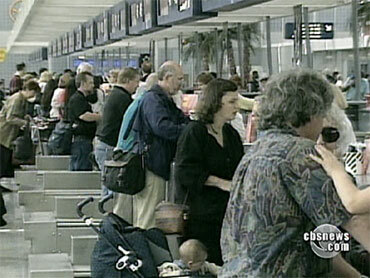 However, CBS News Travel Editor Peter Greenberg shared some insider tips that could save you a lot of time -- maybe 90 minutes or more -- at the airport. • Pack carry-on with items in clear bags (time saved: 10 minutes) -- Use Ziplock bags when packing items in your carry-on bag, and by doing this and dressing after you pass security, you save between five and 10 minutes. • When arriving for an a.m. flight, go to the arrivals level: (time saved: 10 minutes) -- Greenberg said when arriving at airport for a morning flight, go to arrivals level -- not departure. "No one will be there," he said. "Just go up the elevator or escalator to your flight and avoid the congested airport departure traffic. Since you already have your boarding pass and no checked bags, you can go right to security." • Choose a security line wisely: (time saved: 10 minutes) -- At security checkpoints, don't just look at the lines, look at the Transportation Security Administration (TSA) personnel, Greenberg said. Greenberg said if you see two TSA officers looking at a video monitor above the conveyor belt, that's the line to avoid. He explained, "I don't care how long the other lines may look, whenever you see two TSA officers looking at a video screen, chances are excellent they are in a training session, and every bag will be stopped on that conveyor belt and scrutinized. Pick the other line, and you'll save at least 10 to 15 minutes."